No longer marketing’s shiny new object, social media has become an indispensable tool to achieve key business goals since prospects and customers spend at least one out of five online minutes using these platforms. This makes social media too big to ignore. The challenge is leveraging the power of social media to achieve your organization’s key objectives in a measurable way. 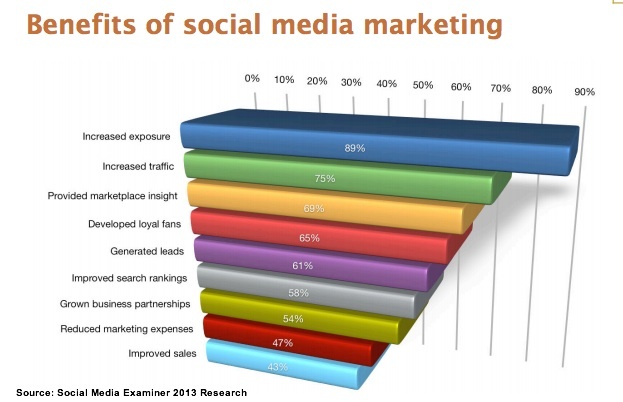 Social Media Examiner’s 2013 Social Media Marketing Industry Report, a survey of a cross section of businesses using social media as part of their marketing mix, highlights nine benefits of social media marketing. Share your content across social media platforms. Regularly distribute content across venues. Remember social media isn’t a one-way conversation. As a rule of thumb, share your content once for every ten pieces of other people’s content. While you can automate this process, it’s more effective to hand craft your messages. Include social sharing on your website and blog. Encourage visitors to share your information with their social media colleagues. Make it easy for visitors to use or you’ll hurt your results. Don’t forget to add social sharing to your product pages as well. Respond to prospects and customers on social media venues. Businesses are notorious for not answering inquiries on social media. Stand out from the pack by answering customer questions. Let your connections know when you’re active on social media. What this means: For many businesses, traffic is the top of the purchase funnel. Social Media helps drive unqualified prospects to your landing pages, microsites, blog and website. Link to information on your blog and website in your blog posts, SlideShare presentations and social media interactions. Offer a mix of links to your owned media (blog and website) and third party sites. Pimp your products on Pinterest. Show your product off with great visuals. Think longer images. Include styling and how-tos. Make sure that all of your images are pinnable. What this means: Businesses find social media platforms useful as listening posts to learn what their prospects, customers, fans and the public are talking about with regard to their products. For smaller businesses, this can be a low cost way to conduct market research. Understand what your competitors are doing. Many businesses underestimate the value of observing their competitors. Think direct competitors as well as large players such as Amazon, eBay, Apple and Walmart. Ask open-ended questions on social media. Engage with your fans and others. This is easy-to-do on Facebook, LinkedIn, Twitter and blogs. Encourage customers to share their photographs and stories. Create customer photo galleries. Patagonia created a Tumblr where customers talked about their favorite item with now and then photos. What this means: Businesses leverage the power of social media’s structure to interact with their fans and nourish their community. Recent research by Syncapse showed that, on Facebook, loyal fans drove revenue post-purchase. Spotlight your customers. Offer one of your customers their fifteen minutes of fame. Highlight them using your product on one or more of your social media platforms. Oreos does this on Facebook. Provide perks. Give your most loyal fans the royal treatment. Think backstage passes. Offer them specials such as early looks at new products. Make them feel special. Provide your fans with special knowledge and the tools to get the word out. What this means: Social media, as a form of inbound marketing, helps attract and qualify prospects. Answer customer questions. This is the Marcus Sheridan secret sauce for blogging. Make a list of your customers’ top questions and respond to each one. Explain how to use your product. Think fun learning by using blog posts, SlideShare, and YouTube. Of course, don’t forget to link to your product pages. Educate your market. Use videos, Twitter chats and Google hangouts to engage with your prospects and let them know more about your product. This doesn’t mean promotion! Respond on forums and Q&A sites like Quora. Help people by answering their questions on forums. Your goal should be to supply information not corporate-speak. What this means: Social media provided alternative ways for businesses to appear on SERPs (Search Engine Results Pages). Don’t overlook the fact that some participants ask their social media colleagues for their recommendations. Lastly, YouTube is the second largest search engine. Optimize your social media profiles. Incorporate your keywords into your profiles. Don’t forget to include your business’ location, phone number and email address so prospects can find you. Show your face. Take advantage of the power of photographs and images but make sure you associate appropriate text with each one. This applies across most social media venues. Claim your authorship and location on Google. Here’s how to get Google authorship. What this means: Social media connections extended offline. This is incredibly powerful, especially for small businesses. It’s power networking that drives results. Reconnect with colleagues and friends. Build on your past relationships. Take social media offline. Meet your social media contacts in real life. Use Meetups and conferences to get out from behind your computer. Think win-win. Just like real life networking, you can’t suddenly reach out and ask people for a favor. You need to build relationships and pay-it-forward. What this means: This is a no-brainer. Don’t assume this means social media marketing is free. Rather social media allows you to reach more people with less expensive forms of distribution and communication. Establish a robust content marketing editorial calendar. Social media runs on content. Therefore, it’s critical to have a continual flow of information and engagement. Build owned media platforms. Establish your presence on one or more social media platforms where you regularly engage and where your customers are. Also, develop your blog as an owned media entity. Test social media advertising. With an ever-growing number of social media advertising options, it’s easier to supplement your social media presence cost effectively with highly targeted advertising that’s relatively low cost. What this means: Businesses can track revenues to social media activities. This is understated since social media often happens at different points in the buying process. Incorporate a social media call-to-action. Encourage your visitors to take action. Make your calls-to-action contextually relevant. Create a Sale of the Day Tweet. This is one place where you can be promotional on social media. BUT you can only make one offer per day! Provide recipes and patterns that link to your product pages. Give prospects and customers guidance for using your product. Entice them with step-by-step instructions. Even better, include a shopping list linked to your product! Show customers how to style your products. This is another way of presenting how-tos. Demonstrate how customers can use your products. This is particularly useful for clothes, makeup and interior design products. The bottom line is that social media drives measurable results to achieve a variety of business objectives. To succeed, set concrete goals, understand your target audience and establish metrics to track your progress. What is your business’ objective for using social media? What tactics do you use to achieve this and how do you assess your progress towards your goals? Tags Actionable Marketing Tip, Chart, Ed Keller, Marcus Sherida\, Mike Stelzner, Social Media Examiner, Syncapse. Bookmark the permalink. Bless you for making the effort to explain the terminology for the readers about SMO services. Thanks for this nice share. Thanks for the great post! I always find great advice and content on this site. Keep the advice coming. I will definitely use tip 25. I forgot about the importance of personalized emails!! Thanks for SMO tips, heidi. I love your tips, no one should ever forget the importance of smo in web world..
Love the actionable tips, Heidi. So many businesses focus on social for increasing exposure and traffic (while hoping for sales), that they often miss the other great opportunities. Your post puts it into perspective nicely! Thanks Heidi for covering the report!